Soup is always a favourite in our house this time of year. It’s so simple to make, it’s a great way to use up leftovers and it’s so comforting too. There are not many things better than coming in from the cold and having a hot bowl of soup. 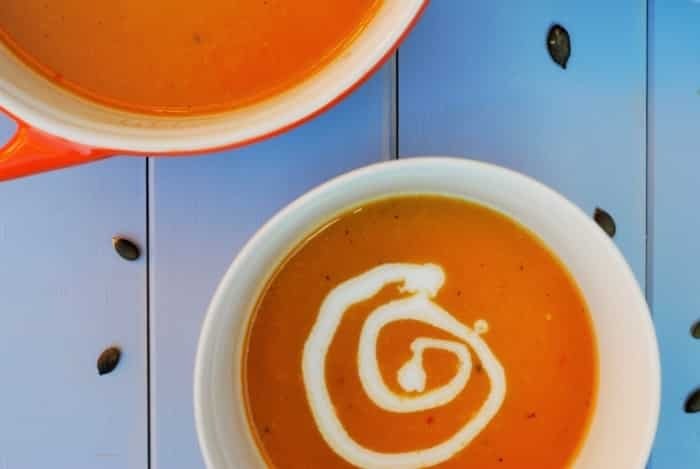 Not only is pumpkin soup a great way to make use of seasonal produce, but it has such a creamy texture when it is blended that you feel like you are eating something much more indulgent than you actually are. The pumpkin recipes just keep on coming here on the blog don’t they. I feel like I am on a roll. Maybe I need to do a pumpkin dessert recipe next. What do you think about that? Pumpkin cookie maybe? Hmmmm. Shall we go back in time? I think we should, as I have a story to share with you all. This is actually the first recipe that I ever shared on the blog, on the 13th June 2011. The day that HHH was born. I am going back through all my really old recipes and photographing them and this one comes under “what was I thinking”. Not because the dish itself is bad, it’s amazing and still one of our favourites, but the photography and the way it is written. If you look carefully, you can see that the bowl is on a tray that is resting on Dave’s lap. I was obviously photographing it before he was allowed to eat it. I have now deleted the old recipe, but I thought it would be funny to share the original photo, so here it is. I was too lazy to even wipe round the bowl? Also, the ingredients made me laugh. In the ingredients it just said “water”. Ermm, how much? That’s quite important for soup. Thanks to those of you that have been following HHH from the beginning and I apologise for the early recipes. I would like to think my photos have improved since then, but I also know that I have a lot to learn in terms of photography and styling. Pumpkins are great for carving, you can turn them in to purée to make a delicious pie, but did you know that they have so many wonderful health benefits too? One portion has more than 200% of your RDA of vitamin A which is great for your eye site, they are packed full of fibre which means you will stay fuller for longer and that can help with weight loss and the seeds can help your heart as they can reduce LDL (bad) cholesterol. So when you make this, don’t throw away the seeds – bake them and snack on them. An added bonus with this soup is that it’s vegan. 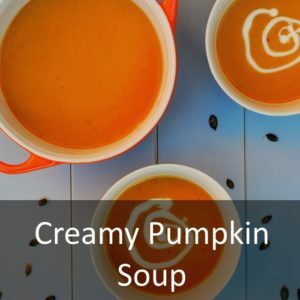 The pumpkin makes it creamy all on its own, but I added a little coconut for some extra creaminess, but to keep it vegan. I do love soup, but I like actually eating food rather than just drinking it. 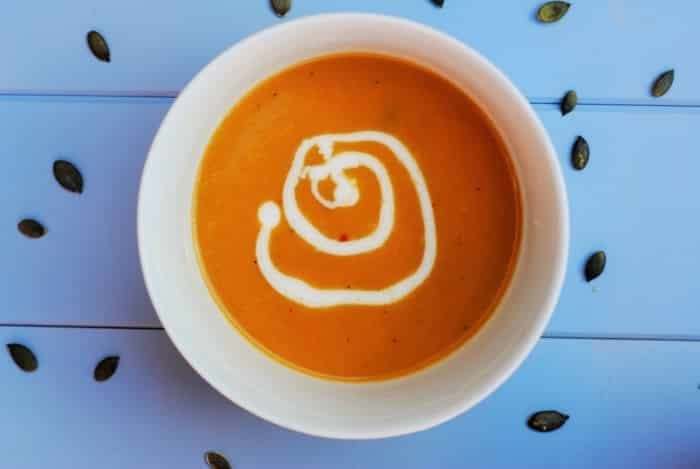 Usually I would have some bread with my soup, but being on a bit of a bread detox means that is out of the window, so I sprinkle some pumpkin seeds in my soup to give it a bit of extra bite. The benefits of this soup just keep on coming. A huge bowl of this is under 150 calories! 150!!! That’s not enough for a meal for me, so I either have it with a salad or a smaller meal, or just have it as a snack. A delicious warming snack. One: Add a little oil to a pan and then add the pumpkin, garlic and onion. Gently cook for 5 minutes, stirring every minute. 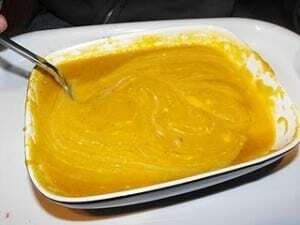 Two: Add the rest of the ingredients and simmer for 10 minutes until the pumpkin has softened. Three: Add to a blender and blend until smooth. 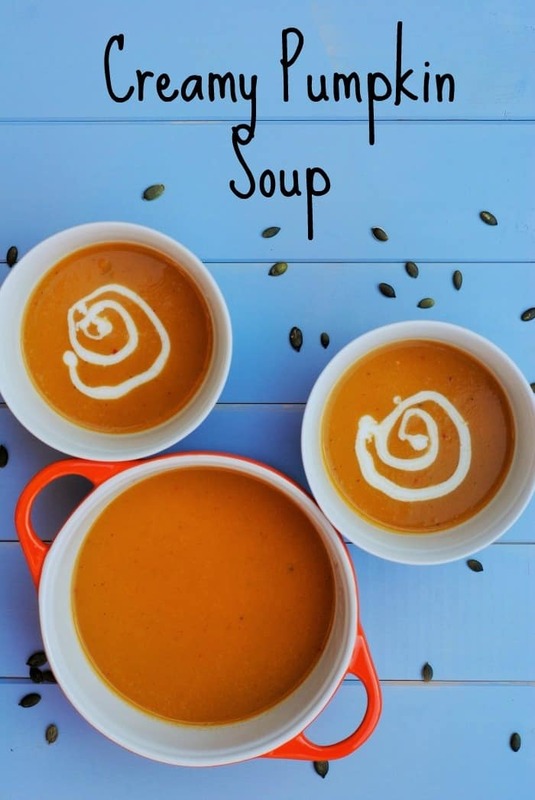 Do you want to be kept up to date on more delicious posts like this Creamy Pumpkin Soup? Please subscribe to the blog mailing list (it takes 30 seconds). 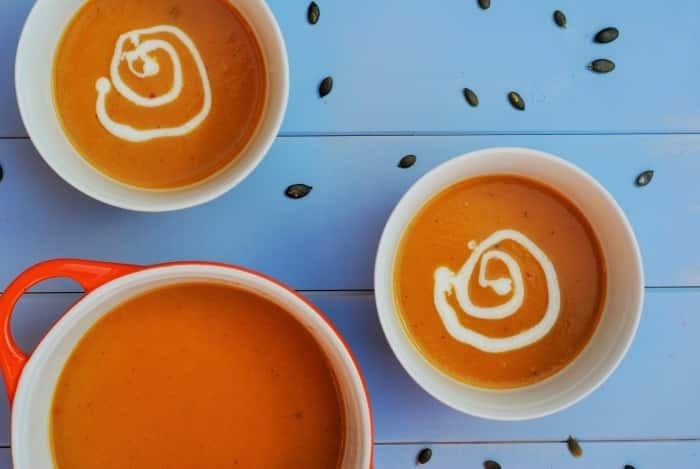 If you’ve tried this Creamy Pumpkin Soup, or any other recipe on the blog, then let us know how you got on in the comments below, we love hearing from you! You can also FOLLOW US on FACEBOOK, TWITTER, INSTAGRAM and PINTEREST to see more delicious recipe ideas, behind the scenes shots and also what we are getting up to. Pumpkin Soup is always a favourite in our house this time of year. It's so simple to make, it's a great way to use up leftovers and it's so comforting too. Add a little oil to a pan and then add the pumpkin, garlic and onion. Gently cook for 5 minutes, stirring every minute. Add the rest of the ingredients and simmer for 10 minutes until the pumpkin has softened. I love pumpkin soup! Love the addition of coconut milk to this! I’m really interested in the health app. I already have a few on my phone, but I’ve not seen this one before so I think I’ll have to give it a try. Anything that helps keep you focused on your health is a good thing. This soup looks so, so good. I’m a little obsessed with orange food – I love carrots, sweet potato, pumpkin, oranges. I swear I’ll turn orange one day! I’ve been pumpkin obsessed too and still have more coming! This soup is so pretty and I can’t believe it’s vegan! Sorry about the bread detox, but the pumpkin seeds seem like a great idea! That old photo is hilarious! I love that it’s on a tray on Dave’s lap! Your photography skills have definitely improved because these new soup pics are stunning!!! Some of my food photos (OK, ALL of my food photos) are dreadful…but then I’m not a super fancy recipe-creating guru like yourself 😉 Your recipe sounds right up my street. I actually made pumpkin soup the other night but sadly had no coconut milk so just added cream cheese instead. It worked! Nice and creamy with a slight cheesiness. Didn’t look as nice as yours though! It’s so cold and horrible here today, I think I might give this a go. Could I use butternut squash instead? What a change in your photos! I am fairly new to your blog, but I don’t think that origianal photo would have attracted me to it haha. Sorry! I like the idea of adding coconut milk to this. 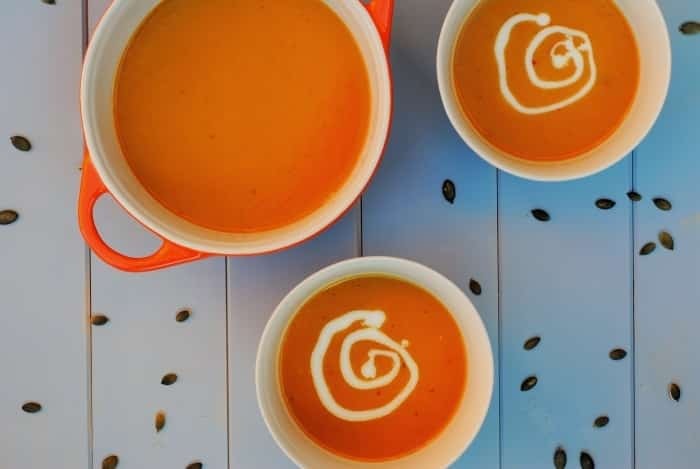 Pumpkin soup is so wonderful this time of year – healthy, delicious, and full of good for you vitamins! I love making pumpkin soup, especially at this time of year. This looks delicious Dannii! Such a great idea to add coconut milk too. Yum! I have some old soup picture too and they are awful! I took them with my iPhone of all things 🙂 I love serving pumpkin soup with rosemary bread. SO delicious! Pumpkin Soup! I’m in love. Can’t wait to try it!! Pinned :). I love the colour of this. We eat a ton of soup through the winter, as its one of the only ways I can get my little one to eat vegetables.